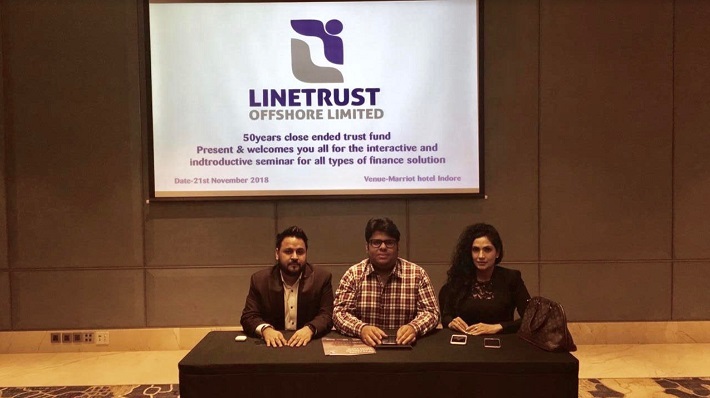 Linetrust Offshore Limited, a close ended trust fund operating from Marshall Island and the United Kingdom had recently organized a workshop to create awareness among the Indian financial community for all its products. The workshop attended to by leading mid and large corporates and leading chartered accountants has been the first of its kind conducted by Linetrust. Mr. Raghav Kapoor and Mr. Mohit Seth, Linetrust associates, who had organized the workshop were very happy with the outcome and said that Linetrust is here to help needy corporates and SME’s with debt at a very low interest rate. Speaking at the workshop Mr. Raghav Kapoor indicated that a Linetrust has been making a lot of changes to its trust policies and has been trying to create a more relaxed syndication routine for troubled corporates and SME’s who have been battling high interest rates and lower than normal revenue growth. Mr. Mohit Seth, a financial consultant and a long term Linetrust Associate said that the Indian tech and pharma wave is yet to grow beyond a few top companies. There are a host of R & D facilities and Incubation centres in India which are in the league of Companies like Cosmo Solutions and inventors like Mr. Nitin Mahendraprasad Gupta who have the potential to deliver top of line inventions that could change the way technology would be viewed in the coming decade but are held back due to lack of a proper mentor or an angel investor who has the faith in such new age technologies. Linetrust believes that the mind is bigger than matter and has invested in a lot of tech and pharma startups and has now plans to enter India in a big way. He was confident that a few more companies like Cosmo Solutions will soon be the beneficiary of the largesse of investors like Linetrust. Linetrust group had been in the news recently for having provided private equity to Energy harvesting tech startup Cosmo Solutions to the tune of USD 950 Mn. Mr. Nitin Mahendraprasad Gupta, Technocrat and inventor and also Managing Director of SS Energia, has been reaping rewards from across different countries and continents for his latest invention. He has been busy finalizing the location for setting up his manufacturing plant. The South African government has provided Cosmo Solutions with 100 hectares of land to put up his manufacturing facility to produce the various products under the Cosmo stable using microcontrollers as the base. This will be the first of its kind product in the world. Having patented the product and now ready to take gigantic steps, Mr. Nitin Mahendraprasad Gupta is a happy man. Mr. Nitin Mahendraprasad Gupta, has been meeting various industrialists who has envisaged interest in his product line and has a confirmed order book to supply over USD 2 Bn worth of energy efficient products. Mr.Nitin Mahendraprasad Gupta, has recently found a cure for Type – 1 diabetes and is credited with curing a few people totally. He intends to commercialise production on a large scale. Dr. Sailesh Lachu Hiranandani, whose penchant for investments in tech startups has been renowned and who has been the principal force that helped clinch the deal for Cosmo Solutions, is watching the Indian tech space with an hawks eye. He has sent scouts like Mr. Kapoor and Mr. Seth to identify future based startups in the fields of Neural networks and artificial intelligence who could change the face of the future tech story. He ensured all the final blocks are cleared to ensure seamless participation of Linetrust in any tech project that has an eye for the future. He congratulated Mr. Nitin Mahendraprasad Gupta on their latest land acquisition from the South African Government. Mr. Rahul Shah, Executive Vice President, Cosmo Solutions and Managing Partner, Master Tours and Travels thanked the team from Linetrust in helping Identify South Africa as the destination for manufacturing their innovative products. South African Speaker of the Parliament Ms. Baleka Mbete, congratulated the team of Linetrust Offshore and Cosmo Solutions to bring the future of technology oriented development to South Africa. She has already assured the team from Cosmo Energy that they will get have access to free electricity for five years and a tax holiday for 10 years. Mr. Mahesh Solanki, Chartered Accountant was keen to participate with Linetrust and help bolster the toplines and bottom lines of Indian corporates plagued by high interest rates and mediocre consumption story. Mr. Sudhir Joshi, CA representing Fadnis and Gupte, one of the leading accounting firms in Indore, has been appreciative of the efforts taken by Mr. Kapoor and Mr. Seth in organising such a workshop which he feels will open big doors for corporates and SME’s. He says that the Indian corporate sector will benefit hugely from financial institutions like Linetrust providing debt at very low interest rates. Ms. Mary Mam, director Linetrust, have suggested that it will be easier for the funds to raise money from investors when technologies are unique and future centric. She is already conducting road shows across the globe to raise awareness and funding to promote new age technologies in the fields of biotechnology, nano technology, pharmacology, media and IPTV. Ms. Jasmine Khongka, associate Linetrust, has been vocal about her thoughts on low cost funding being the only key for the current global economic revival. She has reiterated that as margins are getting squeezed returns are diminishing and the global village is trimming its bottom line. Linetrust as a viable alternative to brick and mortar funding will be key to future businesses. Linetrust executives Mr. Prasanna Shah and Mr. Kalpesh Raygandhi were confident of the success of the outcome of the workshop and said that this is just the beginning and shall arrange for a second round of workshop soon to bring in a larger volume of corporates. Ms. Simran Ahuja, entrepreneur says institutions like linetrust are the need of the hour as globally industries are facing a severe cash crunch and absolutely depleting bottom lines. Linetrust DSA, Mr. Manoj Todi and longterm associate Mr. Mahendra Joshi expect a turnaround in the credit advances to pick up in the last quarter and hope to see earnings increase in the coming financial year. With lenders like Linetrust coming up with big ticket advances the Indian debt market looks poised for a huge turnaround and hopefully we shall be seeing more offerings from the Linetrust stable. Mr. Natesh Sharma, Tech Investor and entrepreneur said that Linetrust is the biggest boon to the Indian Corporates.